I used a quick style change with find in PagePlus. I find a text, click on Select all, and replace style on paragraph styles window. Now I tried same function with find. 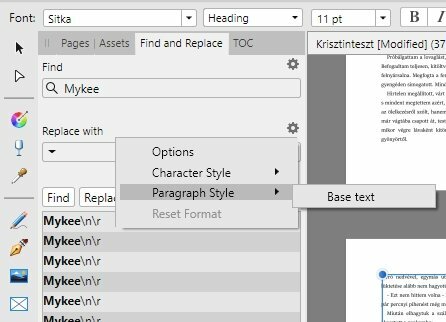 Word has founded, but in Options menu of Replace with I see only my custom style only, no other style (Heading paragraph or other). Click on ANY gear for Paragraph Style, and there is have only custom style.